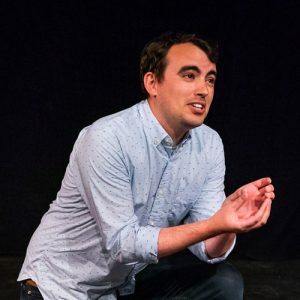 Brady Peters liked improv way after it was cool. After listening to improv podcasts and watching a lot of 30 Rock, Brady thought he’d like to give improv a try. So when he moved to DC in 2016, he signed up for classes with WIT, and finished the curriculum in just over a year. You may have seen him with indie team My White Mom or on the metro carrying too much toilet paper. Brady is a copywriter at an anti-slavery nonprofit and lives in DC with his wife. Fun fact: Brady grew up on a farm in Kansas but has never seen a tornado. If you tell him he’s not in Kansas anymore, he’ll laugh and laugh and laugh. Making owl noises with my hands?